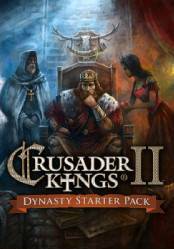 Crusader Kings II: Dynasty Starter Pack is a package that includes the original game and five of the DLC of this strategy game: Crusader Kings II Ruler Designer, Legacy of Rome, Sword of Islam, The Old Gods and Way of Life. An edition aimed at newcomers, new players who want to embark on this superb strategy game. This starter pack brings together all the essential content. With this pack, you'll have access to all Christian, Pagan and Muslim backgrounds in Europe and the Mediterranean, as well as a key role in the expansion that brings to life the complexities of court drama on your screen. The Middle Ages may be coming to an end, but Europe is still in crisis. Little lords compete against besieged kings who struggle to exercise control over their fragmented kingdoms. The Pope calls for a Crusade to protect Christians in the Holy Land, even when he refuses to relinquish control of the bishops' investiture and their wealth. Now is the time for greatness. Expand your dominion and secure the future of your dynasty. There are no comments yet about Crusader Kings II: Dynasty Starter Pack. You can be the first one!